Upon this gradual convergence of different demographics, the Hindu population reached a critical mass leading to the construction of the first temple (presently located on the western end of the present temple). Due to the limited number of people involved, this early building was minimalist in shape and design. 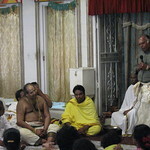 In later years, infused with manpower and monetary funds, the enthusiastic Mississippi Hindus formed a committee for the task of constructing the first authentic Hindu Temple in Mississippi along the strict codes of Vastu Shastra (rules which guide the dimension, proportion, and orientation of the physical structure). 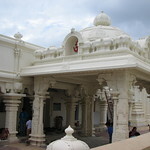 As a result of the dedication and diligence of the entire Hindu community of Mississippi, artisans from India, and local contractors, the temple structure was completed and the present Hindu temple became fully operational on Monday, July 12, 2010.